Zimbabwe 308 for six beat Kenya 147 all out by 161 runs. 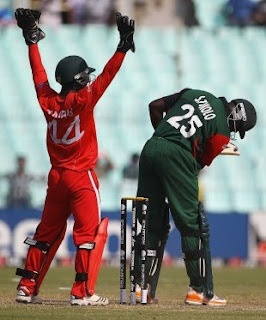 There were all round contributions from the Zimbabwean batsmen, with Taibu 53 of 74, Sibanda61 of 57 and Ervine 66 of 54 excelling with the bat, Otieno with 2 wickets for 61 was the pick of the Kenyan bowlers. Kenya were never in the picture and were bowled out fr 147. Price, Lamb and Cremer, picked up two wickets each. Mpofu and Utseya picked a wicket apiece.